Pardon me for not getting too excited about an Aussie TV show. Sunday 8.30pm | The disappearance of Madeleine McCann shocked the world. The three-year-old vanished from her bed at her family's holiday apartment in Portugal in 2007 sparking a frantic search that would span a decade. The case was never solved. If this criminal profiler is Pat Brown, then the information is fraudulent. 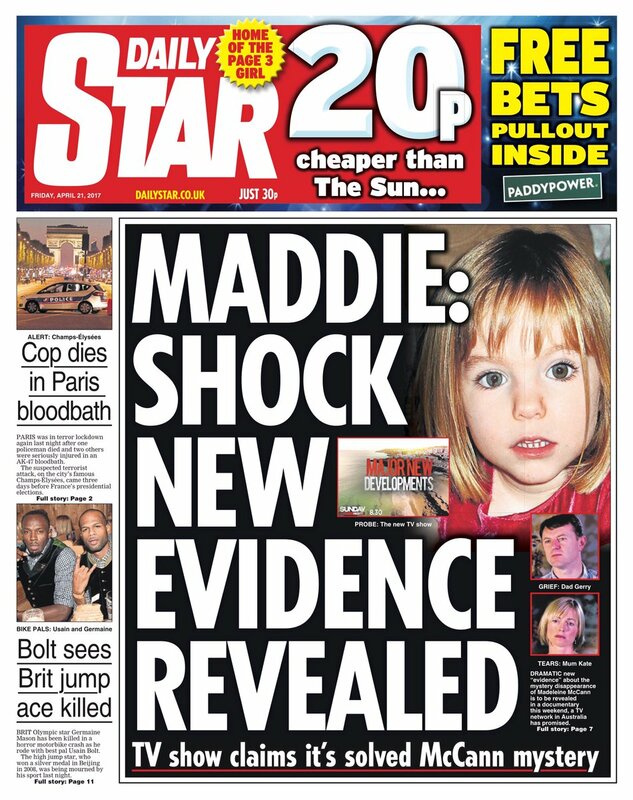 She is not 'at the heart' of the Mccann mystery. She is merely a fly, that buzz around the case. That's what telling lies, going on Ghoul Tours, and exploiting a missing child to big yourself up does, LL. I wonder, is that before or after she slapped the Polyfilla on? The theory of accidental death , which has rarely been approached by the English press, is considered plausible by English citizens, notably those belonging to a Facebook group entitled The Complete Mystery of Madeleine McCann . The members of this group take on the mission of " finding the truth about what really happened to Madeleine McCann," with the reassurance that "not everything the UK press wants you to believe." Bonkers Bennett and the Hounders. Personally, I wouldn't bother about any of the obsessive sh*te the hate squad is currently spewing, except to mock it. We've all heard their sicko fantasies before - sicko fantasies seem to be all they have to live for. Pass. I've got some wet paint that needs watched. Sunday's #McCann Aus Tv special looks ropey. Old interview with Goncalo edited, Pat Brown edited. Seems the host is to diss them both! So, it isn't an hour of Gonzo's imaginings, cod science and forum myths, then? She should get Bennett to write one of his multi-coloured complaining letters. Oh dear, the haters are showing themselves up again, attacking the Aussie station's FB page with forum myths about imaginary blue bags - the usual bollox. How funny, they're even raving about imaginary fridges now. Haters are as predictable as sunrise. "If this criminal profiler is Pat Brown, then the information is fraudulent. She is not 'at the heart' of the Mccann mystery. She is merely a fly, that buzz around the case." the same can be said about amaral, which don´t know the meaning of the word investigation, he don´t know what is really investigate. Well, I won't be watching this, Pedro, on FB or anywhere else. I doubt very much if the makers have anything new to say. And in the unlikely event that they do, then they should be talking to the REAL police, not playing armchair defective on Aussie television. And then they will copy their own comments back to their home cesspits, claiming that the lies and hate are being posted by 'members of the public'. They haven't been this busy in ages. 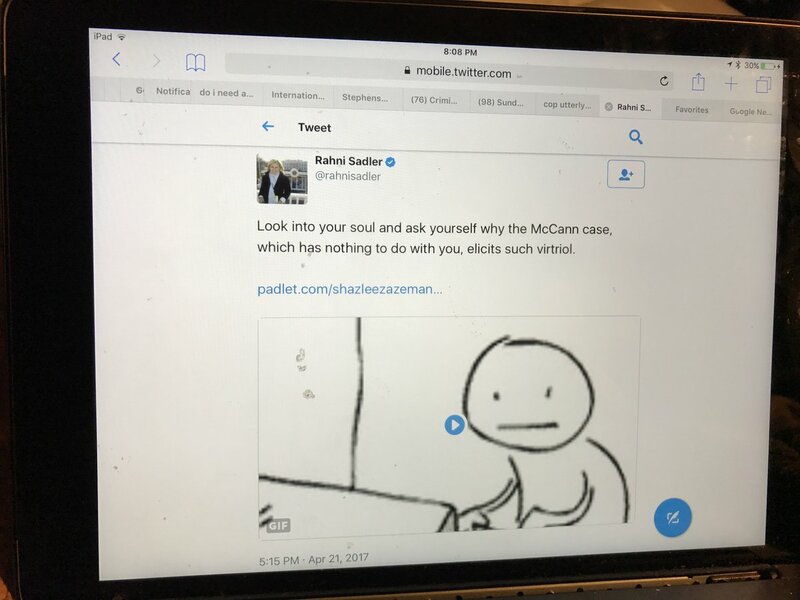 She can't see that Ms Sadler is absolutely right about her. That's so funny, it sounds as thought the producers of that programme have sussed Brown out. It has nothing to do with her or any of the ones she associates with either. I can't wait to see what the Sun says, Max. These idiots are so desperate for attention - any attention - they never, ever learn. Running commentary from someone watching the Aussie documentary. Sounds like the haters are going to be chewing their last shreds of carpet. So, Gonzo looks seedy and sweaty? No change there, then - and his groupies will still worship him. GM: I went outside (after it was discovered Madeleine was missing) and was totally aghast I could lift the shutter from outside. Not half as aghast as Dirtymac was. 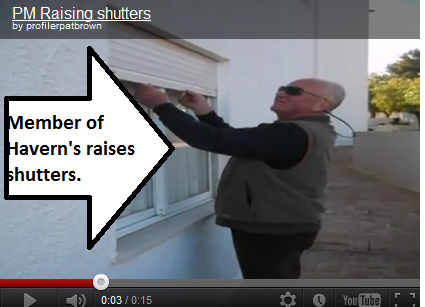 Wonder why Gonzo the Great didn't know about the shutters, and chose to spread falsehoods about them instead? Has Gonzo got something to hide? Looks like Bushmeat has made a bit of a t*t of herself. Not for the first time. EX-PORTUGUESE police chief Goncalo Amaral has claimed MI5 helped cover-up Madeleine Mcann’s body after her parents accidentally killed her. The controversial detective made the shocking claims on Aussie TV show Sunday Night, which looked into the unsolved disappearance and suggested Madeleine’s body could be hidden in a well on Praia da Luz. Gonzo should stick to burbling drunkenly in the corner of the Bull's Head, he's clearly lost the plot. When even Cristovao you, you know you're a loser. And yes, he is sweating like a pig.